We have got very high reputation in providing wedding cars in Melbourne. It is your special day. The dress has been booked for months. The suit measurements have been taken and the fabric has been bought. The caterer knows whether it is tuna or halibut and the mother of the bride is preparing a song to perform at the reception. The flowers are booked and paid for. Everything is as it should be. So why not put one more detail in order? Make sure that on your wedding day, you travel in utmost style. We offer you a huge range of cars and more aptly limousines to make sure that on your wedding day, when you travel you feel like royalty. We have a host of options on offer and you can customize the pickups and drop offs just the way you want them to be. A wedding can be a stressful experience with so many factors that need to come together and be choreographed in such a manner that everyone remains happy. Book with us and we will ensure that the travel arrangements need not bother you one bit. Whether it’s the limousine for the bride and her flowing long dress or for the groomsmen to ride in style,we can arrange it all in no time at all. Luxury wedding Cars in Melbourne can be booked keeping affordability in mind with our unique customizable plans. 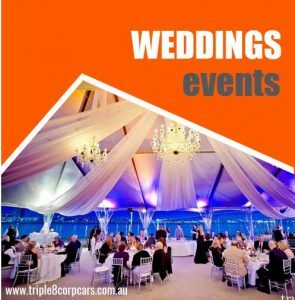 We also offer arrangements for larger groups that will also suit your budget and take the stress out of the wedding planning. If you have any additional requirements like a car seat for the flower girl or a booster for the bridesmaid’s little darling, we can make sure that you have them in place. Most significant aspect of our service is our dedication to your safety. We know it is an important day so even for short distances we make sure that the car is tuned up and good to go. It is the day that you and your better half start an amazing journey together. Let us make sure that your journey to that point is absolutely safe, convenient and obviously stylish and luxurious as well! We are aware that it is absolutely vital that everything at the wedding happens in a timely fashion. For this you have the assurance of punctuality and a swift and supple to and fro service. Wedding car hires need no longer be tricky and confusing with our wide array of options and customizable plans.